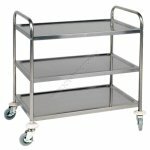 A sturdy, stainless steel lab trolley. Rigid construction with sound deadening under each shelf. • The clever design includes easily cleaned rounded corners on every shelf. • Two wheels can be locked. • The trolley is very, very easy to assemble and comes with the required Allen key and spanner.